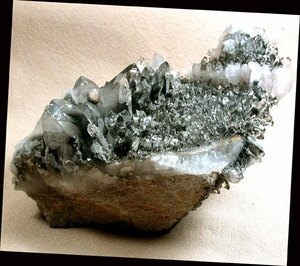 This cluster features rock crystals var. blue phantoms [dark shale] on sandstone matrix showing some iron oxide, with a 1/2" tall "necklace" of completely white points and tabular crystals. The phantoms are multi-dimensional and are from almost drusy to 2+1/8" x 3/4"; there are record keepers and many rainbows, as well as several uncommon 7th faced crystals. Securely self-displays three ways, and is overall 7" x 6+1/2" x 3+3/4" for a commanding and glittering show.